Fiber Optic Box IP65-FBR Series by Bud Industries » HHP Associates, Inc. 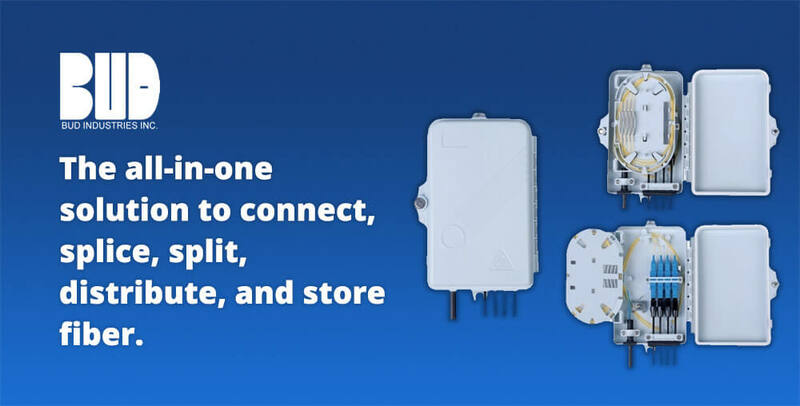 The all-in-one solution to connect, splice, split, distribute, and store fiber. Fiber to the home (the curb, the neighborhood) – FTTx – is transforming communication. But fiber optic cables need an easy storage solution where feeder cables meet up with drop cables. In order to house the cable, boxes also need to secure any splicing, splitting, or other distribution necessary. BUD Industries’ fiber optic box is build to IP65 standard for indoor use. It protects and manages the FTTx building. Inside, the fiber is totally enclosed, and a locking mechanism prevents theft and vandalism. We are honored to serve as a manufacturer’s rep for Bud Industries, the best known electronics enclosure manufacturer in the United States. 19 inch cabinets, NEMA boxes, IP65/IP66/IP67 enclosures, communications cabinets, small metal enclosures and accessories.